Photo provided by Kim Moody. Hogwarts Running Club is one of many virtual running clubs that’s bringing people around the world together. In the Harry Potter universe, you need access to Platform 9 and ¾ to get to Hogwarts. But for the web-based Hogwarts Running Club, you just have to log in. “The beauty of HRC is that [location] doesn’t matter; you can participate wherever you are in the world,” says Kim Moody, the “Hufflepuff Head Girl” of the Hogwarts Running Club. Hogwarts Running Club is one of many online running clubs that has recently gained popularity with runners interested in joining an athletic community but unable to join a local club.This particular club is part of Random Tuesday, Inc., a registered nonprofit organization that combines online running clubs with super fandom. HRC is in the company of Random Tuesday’s two other virtual clubs: the Whovian Running Club (for fans of Doctor Who) and Chilton Running Club (for fans of the fast-talking TV show Gilmore Girls). “Together, these programs have more than 70,000 members in more than 60 countries who’ve logged over nine million miles to improve their own physical fitness,” says Brian Biggs, CEO of Random Tuesday. Moody is just one among those thousands of women and men who were inspired to run through their connection to a pop-culture community. Once Moody joined HRC, her fellow Harry Potter fans encouraged her to embrace the sport, and she began losing weight. Since joining, she has signed up for both virtual and in-person races, and has also added weightlifting, aerial silks and aerial yoga to her fitness routine. HRC members stay connected through “Common Rooms” on Facebook, but each member of the Harry Potter houses—Gryffindor, Hufflepuff, Ravenclaw and Slytherin—can meet in a larger group called the Great Hall, where they swap encouragements, mileage data and other achievements. Random Tuesday’s clubs host their own virtual running events, where runners register, choose a distance and run the race on their own. The proceeds go to a chosen charity (Random Tuesday currently works with 40), and runners receive their own finisher’s medal in the mail shortly after completing their race. Random Tuesday’s online running clubs launched after Biggs’ wife finished her first half marathon. Biggs says he had “medal envy,” but couldn’t connect with a traditional running club. A Harry Potter fan, Biggs started the Hogwarts Running Club in March 2014. 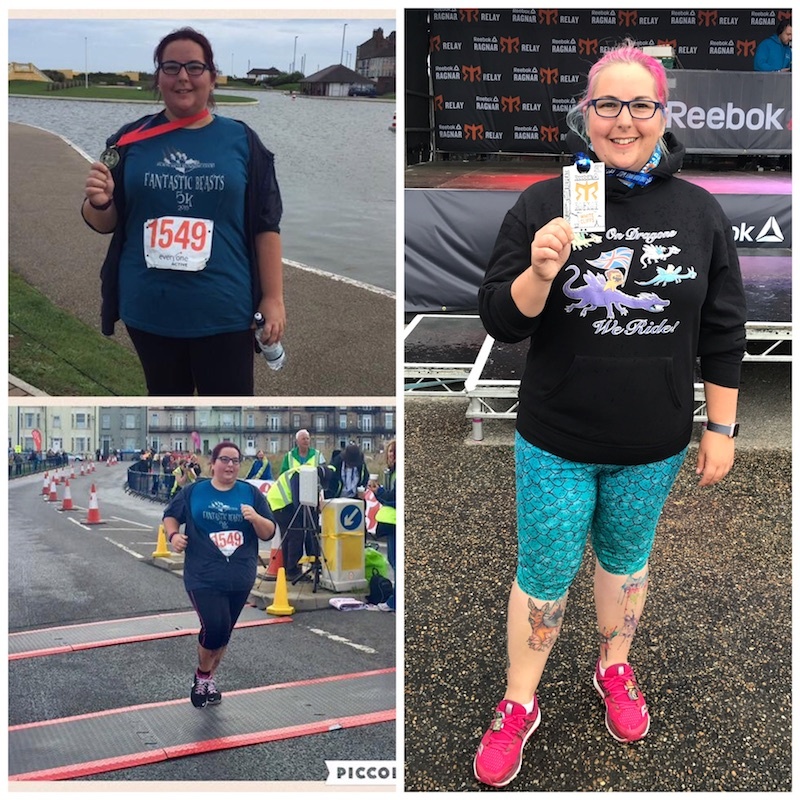 “Virtual running is an amazing way to keep fit and motivated and to meet wonderful people,” Moody says.“It’s great to find a place where you can ‘nerd out’ and not worry about it. Uniqueness is encouraged and celebrated, and especially so in Hufflepuff. We have the saying, ‘Every member matters.’” Though the clubs are primarily virtual, Moody is one of many who’s taken the community feel a step further and made an effort to connect with her virtual running buddies in person. Online, the communities host fitness challenges, viewing parties and share fan favorite memes to stay connected. HRC members also compete in House Cup competitions, in which runners earn points by logging miles. Those miles are logged through Charity Miles, an app where participants log their workouts to earn donations for a chosen charity. The earned dollars are paid directly to the charity from corporate sponsors. In total, Random Tuesday club members have donated thousands of scarves and socks for the homeless through running. They’ve helped Syrian refugees and Puerto Rican residents recovering from last year’s Hurricane Maria. Recently, the group gave more than one million colorful bandages to children fighting cancer. According to Biggs, the “fanthropists” have donated more than $2.1 million since Random Tuesday’s launch four years ago.